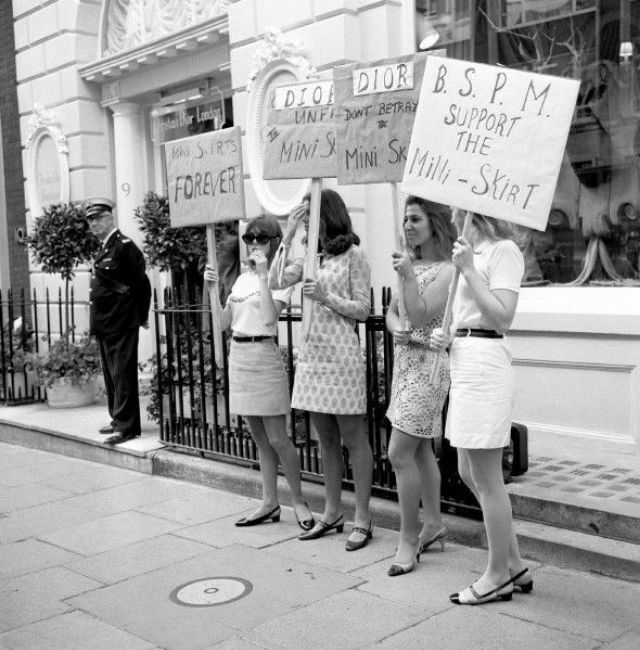 Calling themselves members of “The British Society for the Advancement of the Mini-skirt” these mini-skirt enthusiasts were protesting outside Christian Dior’s premises about the below the knee creations. 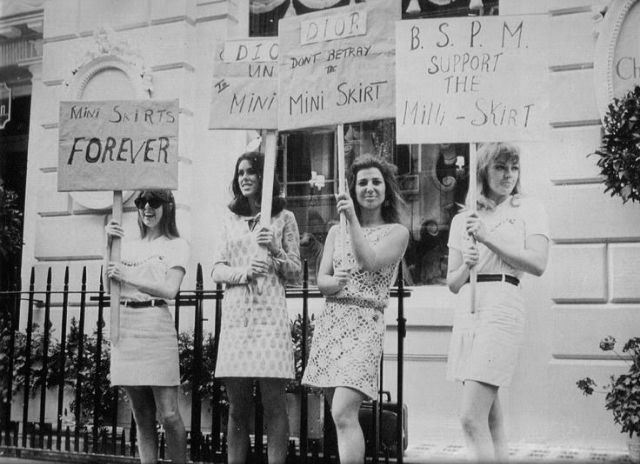 The Mini-skirt first emerged on the catwalk in 1964 and was reputedly designed by the pen of Mary Quant. She named it after her favorite car and, whilst probably not realizing the influence it would have at the time, caused a revolution in fashion and also had a massive impact on the feminist cause. In addition she had designed the most defining fashion trend of the decade. 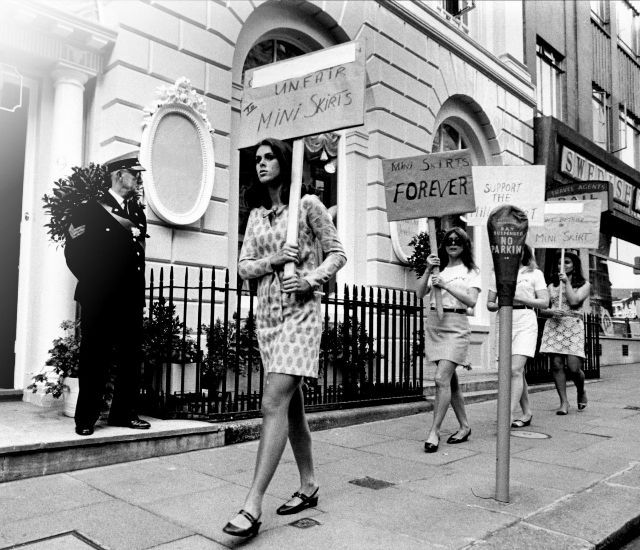 The mini-skirt empowered women to move out of the shadow of dressing like their mothers and alongside the contraceptive pill was complicit in ushering in the sexual revolution that challenged traditional codes of behavior and upset many traditional more conservative commentators who foresaw the beginning of the end of society as they knew it. 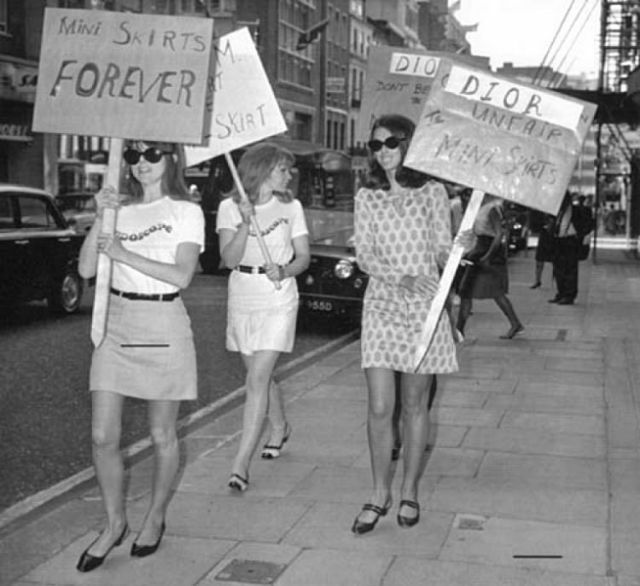 Fortunately the world didn’t stop turning because hemlines shortened and women became more empowered but that didn’t stop people protesting at the time against the new-fangled miniskirts and even fashion big-hitter Christian Dior was rather sniffy about the new fashion. However, once women had experienced the freedom of skirt-length equality there was no turning back and as if to prove that for every action there is an equal and opposite reaction a number of protests sprung up defending the new higher hemline. Whether the British Society for the Advancement of the Mini-skirt is still in existence seems unlikely but we do admire its raison d’etre. The mini-skirt hemline has risen and dropped over the following decades and many have commented that the length of the skirt can be directly attributed to the state of the economy and confidence at the time but to our knowledge there is no statistical evidence of this. Certainly the boom times of the sixties when we’d never had it so good saw the birth of the mini-skirt and it’s never really looked back since.